I don’t write posts in which I adapt a recipe from a cookbook very often. And when I do, it’s because the recipe is so great that I have to share with you all lest, to use a Thai expression, I die from my chest bursting open (อกแตกตาย). 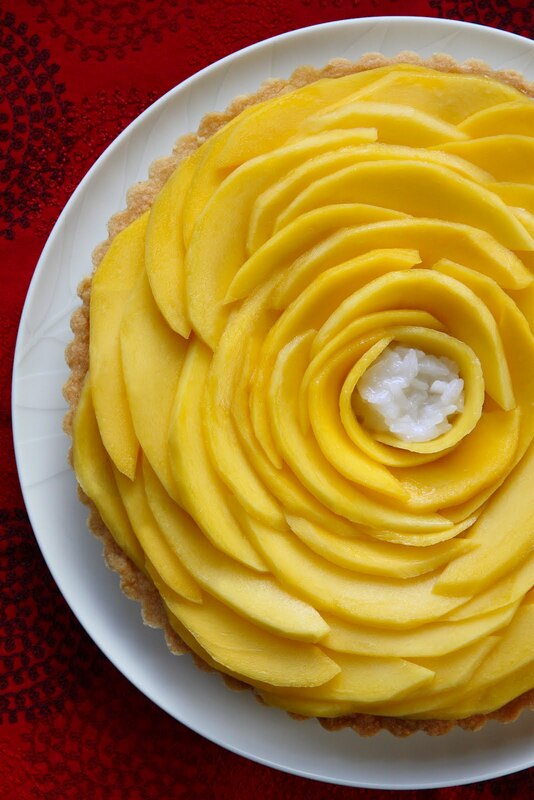 Hyperbole aside, this mango and rice tart recipe from The Modern Baker by Nick Malgieri, arguably one of America’s most respected baking authorities, has been made several times in my kitchen. The recipe is absolutely perfect and, with such thorough and precise instructions (which can always be expected from this author), the result is foolproof. The Modern Baker, first published in 2008, is now available in paperback edition. If you don’t have it, please get one. I have so many cookbooks in my library from which I’ve never cooked. This is definitely not one of them. You can tell just by looking at my copy: lots of butter stains and notes scribbled all over the margins (gosh, I’ve turned into my mother …). Intrigued by this delicious and creative tart that is a Western way of presenting the iconic Thai dessert, Khao Niao Mamuang (ข้าวเหนียวมะม่วง) or Thai coconut sticky rice and mango (albeit with jasmine rice instead of sticky rice which works very well in this recipe), I reached out to Nick for an interview. Your first trip to Thailand was in May (2006) which is one of the best months of the year fruit-wise. How would you describe that experience? It was exciting and enlightening. Tasting Thai food on site and experiencing how the hot, sour, salty, sweet, and bitter flavors are blended together makes it easier to understand how to prepare and season it outside Thailand. In your own words, you “became absolutely crazy about every kind of Thai food”  since that trip, and started preparing it a lot at home. Also, Thailand has ever since become — as you’ve mentioned on your website — one of your favorite places to visit. How has this recent exposure to Thai cuisine in the motherland added to your pastry repertoire? Will we see more Thai-inspired recipes in your future books? I’ve done some research into Thai desserts and published a few articles about them, but I haven’t concentrated solely on desserts. How did you come up with Mango & Rice Tart? Am I right in thinking that this is a brilliant mash-up of Torta di Riso, the Italian sweet ricotta-rice tart, and Khao Niao Mamuang, Thai coconut sticky rice and mango? Mango and Rice Tart has absolutely nothing to do with an Italian rice tart that has a baked rice custard filling. 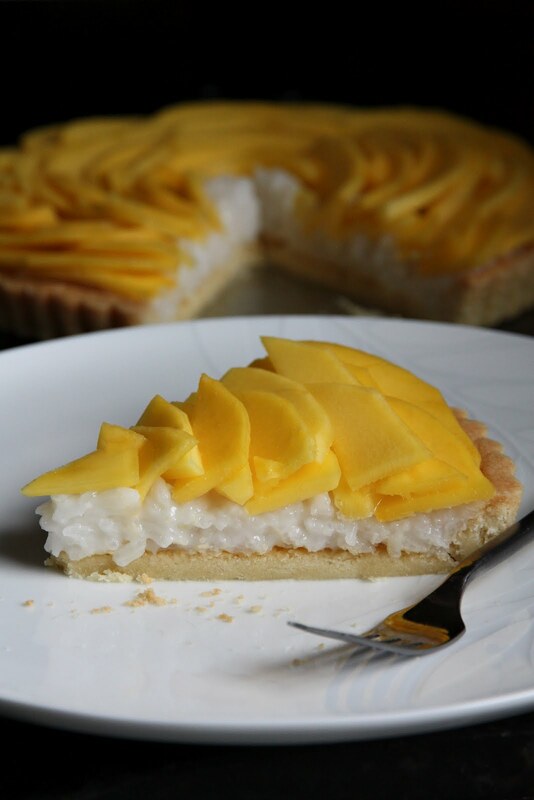 The filling of the mango and rice tart is an approximation of the classic Thai sweet of a sliced ripe mango with sweetened coconut sticky rice, but in a crust. After having made the recipe a few times, I have come to the conclusion that the recipe is perfect as it is. However, it has been almost four years since the hardcover edition of The Modern Baker was released, and I’m wondering whether you have experimented with or thought of some other ways to add variety to it since then. If so, would you like to share them with us? This recipe has not changed, but some printing mistakes in other recipes were corrected [in the paperback edition ~Leela]. Personally, when it comes to Khao Niao Mamuang, I adamantly refuse to use any types of mango available in North America other than Ataulfo. I’m wondering whether you feel strongly about what type of mango is best for this particular recipe. Also, during the time of year when mangoes are not at their best, are there ways to fix them before using them in this recipe? While I’m not familiar with a lot of mango varieties by name, I always look for the flat, “slipper-shaped” yellow mangoes that are similar to the ones used in Thailand. Aside from their sweetness they’re also not fibrous like Indian mangoes. If all you can find is a large red and green Indian mango, just make sure it’s ripe and cut the flesh into very thin slices for the tart. I’d like to thank Mr. Malgieri for answering my questions and allowing me to reprint the recipe from his book. Ataulfo mangoes are in season in North America right now, and this is the only time of year when mango and sticky rice should be made, in my opinion. You guys in Thailand, ok rong and nam dok-mai will be absolutely perfect in this recipe. Combine the butter, sugar, and vanilla in the bowl of an electric mixer. Beat with the paddle on medium speed until whitened, about 5 minutes. Beating the butter and sugar aerates the mixture, and the air helps the dough bake to a light texture. Add the egg yolk and continue beating until it is absorbed and the mixture is smooth. Use a large rubber spatula to incorporate the flour. Cover the pan with plastic wrap or slice it into a plastic bag and seal securely. Refrigerate the formed crust for at least 1 hour or up to 2 days. About 20 minutes before baking, set an oven rack in the middle of the oven and preheat to 350°F (180°C). Use a fork to pierce the chilled tart crust at 1-inch (2 1/2-cm) intervals to keep it from puffing up and distorting while it’s baking. Bake the tart shell until it is evenly golden, 20-25 minutes. Check occasionally after it has been baking for about 5 minutes. If large bubbles appear on the bottom of the crust, slide out the pan on the oven rack and quickly pierce the bubbles with a fork to flatten them. Cool the tart crust on a rack. Bring the water to a simmer in a heavy medium saucepan that has a tight-fitting lid. Add the rice and stir once. Reduce the heat to medium-low (not the lowest setting), and cover the pan. Let the rice cook for 20 minutes. 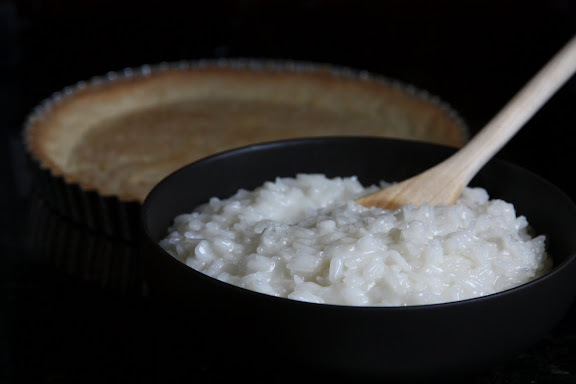 While the rice is cooking, make a syrup from the sugar and water. Combine them in a small saucepan and set over low heat. Stir occasionally so that all the sugar dissolves. When the syrup comes to a boil, let it boil for 3 minutes, then scrape the syrup into a heat-proof bowl (if there are a few undissolved sugar crystals in the syrup it’s okay). Gently stir the coconut cream and salt into the syrup until smooth. Scrape the hot rice into the sweetened coconut cream and use a large rubber spatula to gently mix them together. At this point, the mixture is very liquid. Leave the rice in the bowl, uncovered, until it is completely cooled and has absorbed most of the coconut cream, about 3 hours. Cover the bowl and let it sit at a cool room temperature. When you are almost ready to serve the tart, scrape the coconut rice into the tart crust and spread it evenly with a small offset metal spatula. Arrange the mango slices over the rice in an overlapping concentric pattern, reserving a few of the smallest ones for the center of the tart. Nick Malgieri, The Modern Baker(New York: DK Publishing, 2008), 170. Because of the presence of the sugar and egg, this dough sticks to itself easily, so some recipes call for the dough to be pressed into a pan rather than rolled out and then transferred to the pan. To press the dough into the pan, cut off about 1/3 of the dough and reserve it. Using the floured palm of your hand, press the larger piece of the dough to cover the bottom of the pan. Divide the remaining dough into 3 pieces and roll each into a cylinder about 10 inches (25 cm) long.Arrange the 3 cylinders of dough against the inside of the pan, slightly overlapping where they meet, to form the rim of the tart. Using floured fingertips, press the dough against the side of the pan, making sure it is well joined to the dough in the bottom of the pan. Use your thumbs, held perpendicular to the pan, to press the dough against the side of the pan. Make sure the dough on the side of the pan is even in thickness — if it is thinner at the top where the heat is strongest, the edges will burn while it’s baking. Sign me up for the book ‘raffle’! Love your blog! Do you do the photography yourself? Gorgeous! this is lovely, rather genius… like your mango/rice sushi creation a few years ago. i wonder if the crust is too carb-overload-y? I would love a copy of the cookbook. The pictures here are beautiful. Angry Asian – I thought it would be too. But this works surprisingly well. Fascinating recipe – a traditional Thai dessert fused with modern pastry technique . . . cannot wait to try this out. Love your cooking and writing ! I would love to have a copy of this book. leela, as always great photos! The book sounds interesting. Rice, mango & tart – what an intriguing combination. I think my brain is still frozen with confusion – trying to imagine what the flavours taste like! I wonder if I will have the patience to arrange all those mango slices! Well, I guess there is one way to find out! I would love to win a copy of the Modern Baker! I would love a copy of The Modern Baker! Would love a copy of the book. Love mango and sticky rice. Please sign me up for the book drawing. I would love a copy. In the meantime, I’ve been eating as many Ataulfo mangoes as I can get my hands on. I love mango season! Yum! I have really been missing Thai food since I returned to the states a few years ago. I love this blog, and would definitely love a copy of the Modern Baker as well. Thanks! This looks amazing! I would love to see what other recipes are in the book! Pick me! 🙂 I’d love to have a copy of that book. This is beautiful! Not sure if I can find the right mangoes, but I’m going to check at our local Asian market this Saturday when their produce comes in! Would you mind to take a quick moment to explain what is meant by “Thai coconut cream”? Is this something that comes ready-made? If so, do you have a specific brand you might recommend? Thanks! And, yes, I forgot to say that I would love to have a chance at winning the book! BoiseNoise – I simply use unsweetened canned coconut milk, targeting the creamy, fatty part that rises to the top. Make sure you don’t use low fat coconut milk. Mae Ploy or Chaokoh is best. What a delicious recipe. I can’t wait to try it. I would love to try out other recipes in the book! Beautiful picture – I’d enjoy a copy of the book! Sounds delicious. And yes please, sign me up for the book giveaway! This blog is wonderful, always interesting and often revelatory. Of course I want a free cookbook–who wouldn’t? pick me! me! me! me! i just bought the last cookbook you recommended (Traditional Recipes of Laos) from amazon and read it cover to cover last night.. instead of writing my thesis.. save me from my horrible thesis by bestowing upon me this cookbook! Please sign me up for the book! I will try this recipe out when I come back from a vacation. I also would love a copy of The Modern Baker. What a delicious looking recipe! It involves so many of my favorite tastes. I love the combination of mango and sticky rice but would never have thought to put it into a tart. What beautiful presentation and what a delicious recipe! Superb ! I d love to have a copy of the book. Looks very yummy. Would love this cookbook!! Also, I wanted to tell you that I love that I found your blog; I recently went to a Thai cooking class and have been looking for other dishes to try. Everything I’ve tried so far has been great! Thank you. I think this might become my new favorite dessert. I love Thai food and have only very recently started trying to cook it. Your blogs have been a wonderful and encouraging help and that I thank you. I would really appreciate being entered into the drawing for the cookbook too. I need some good recipe book (and would love other suggestions too if you have them). I’ll try this for my cousin’s birthday. The mangos are in season, I can eat them all day. 🙂 and a cook book please !!!! What a beautiful tart! This is such a creative idea, I love it. Please put my name in the running for the book! I’d sure like a copy of the cookbook. Thanks for posting the recipe. A copy of The Modern baker for me would be very groovy. The tart is so gorgeous! I love how the slices arranged. And I would love to win a copy of the Modern Baker too! Just when I thought this blog couldn’t get any better… a chance at a great cookbook! Count me in, I’d love a copy! Love this presentation of the classic thai sticky rice with mango dessert, definitely a plus if the thai honey mangoes are used. (: Would love to win a copy of the Modern Baker to try out the other recipes as well! I found that type of mangoes at Fred Meyer today! Apparently it was a new produce item for them . . . so new that it wasn’t even in their computer system and no one knew how much they were supposed to charge me! This looks delectable! I’d love to try this. I love Nick’s brownie recipe and would love a copy of this book! I missed seeing Nick Malgieri when he visited Manila a few years back so having a copy of The Modern Baker would sort of make up for it. And yes, I soooooo love mangoes! I’d love to be entered in the giveaway. And that photo of the tart is breathtaking. I just want to say that you’re blog is awesome. My father is Thai and I’ve been trying to understand my Thai roots more through cooking. Glad to be able to find a blog like yours that can help me out. Also, the Khao Niao Mamuang is one of my favourite desserts of all time and the tart version makes it look so pretty. Gorgeous picture ! Mouthwatering dessert ! I will definitely try the recipe when I find the mangoes. I would love to win the Modern Baker book. I’m definitely making this, because it reminds me of your orzo-mascarpone souffle…which was friggin’ AWESOME!!!!! Would love a copy of Nicks book! The winning number has been randomly picked by Mr. @DwightTurner: 47. Only the first of multiple comments by the same person is counted. My answers to people’s comments are also excluded. Kathrynn who posted comment #47 on March 30, 2012 1:27 AM is the winner. Kathrynn, please contact me at shesimmers at gmail. I did end up leaving out the crust instead of making this as a tart, because my step-daughter is allergic to wheat. It was still delicious and absolutely beautiful! Thank you very much for sharing the recipe. Thanks for this delicious dessert. The crust is so light and tasteful. This makes an easy sticky rice. Our Thai friends loved it! We had some leftover rice with coconut milk and we added fresh peach the next day. So, two delicious treats. I so loved Uh Oh’s post that were I to win this book, it would make me delirious with joy to have it go to her. Leela, PLEEEEEEEZE! A question if you have time and energy to spare: saw some restaurants in Australia with their own coconut milk extracting machines. How do they get the copra out of the cracked nut, i.e. get the brown skin off, in the small mechanical devices that fit a restaurant workspace? I have only seen factory type machines, but they run on a huge space. Thank you for shedding any light on this matter. Also, the dry coconuts in the US seem so rancid and without flavor, in the matter of making cream. They all seem to have tiny cracks in their shells, and thus have turned rancid and off-tasting in storage and transit. Somehow, they are not heavy or sweet. I wonder where they come from? Have you noticed this, or am I just unlucky in being in a zombie coconut zone? Thanks. gautam – Sorry, the giveaway was closed a while back. Next time. Regarding a coconut extracting machine, from what I’ve seen, at least one restaurant in the US uses a professional-grade juicer (Champion) to do the job. I think they peel off the brown skins manually. Unless you want your coconut milk immaculately white, there’s no need to peel off the brown skins, though. Coconut milk vendors in Thailand don’t bother doing that. By “dry coconuts,” I’m assuming you meant whole mature coconuts. I have no idea where they come from. The cracks that I’ve seen are intentional, though; it’s not uncommon to see partially-cracked coconuts with a line running around the center like the Equator on the globe. That’s supposed to help make it easier to split the coconuts in half at home. Whether or not these cracks make the meat rancid, I don’t know. It’s possible. best thai dessert. it took us almost a week to finish our tart, it was not a hardship! Hi, just wondering if I were to use a smaller-sized pan, will the temperature and time required in the oven remain the same still? Thanks! Can’t wait to try making this! Stephanie – The temperature would be the same, but the time will be different.